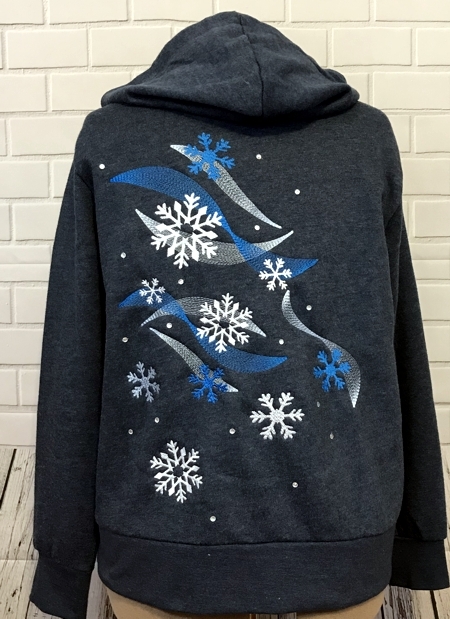 In this tutorial, we show how to decorate a hoodie with winter-themed embroidery. We used designs from the Winter Wind Set in both sizes (Large and Mega hoop). self-adhesive rhinestones or hot-fix crystals (optional). Open the files in the embroidery software on your computer and print out their templates. Cut them out. 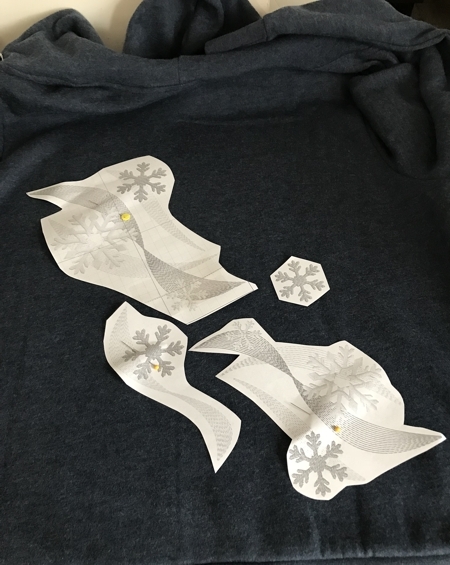 With the help of the templates put together a composition on the sweater. We chose to embroider the back of the hoodie and embroider a couple of snowflakes on the front. With the chalk pencil mark the center of each design. When hooping, align this mark with the center on the hoop grid. Use a small sheet of stabilizer for each design. Don't be tempted to stabilize all the designs with one piece of stabilizer. Cut away the stabilizer around each design immediately after you finish it. Upload the files into the machine and embroider them one by one. Start with the largest desings, finish with the snowflakes. Press the embroidery when you're done. Add some rhinestones/crystals (optional) and you're done.